Thanks to David Cowan for this (geo)graphic pulled from a PPT he posted here. For over a year, I have been listening to David Cowan, a colleague from the Secretary of Interior’s National Geospatial Advisory Commitee, on which we both sit, talk about the importance of a national cadastral data set. Frankly, it all sounded good to me, but I had no idea of the criticality of…parcels. At this last week’s meeting David hauled out a new marketing line for his pet project – “Every toxic mortgage asset has a parcel number”. OK, now this is serious. We have gone from trying to explain why the Federal government should invest in various nation-wide mapping layers (e.g., imagery, elevation, transportation, hydrography, demographics…..parcels!) and a system of systems to manage it all, to one, just one of these layers constituting a $1 Trillion problem for US taxpayers. The bulk of my focus on the dysfunctional US National Spatial Data Infrastructure over the past decade has been fon the opportunities lost to our country’s national security. But, as Secretary Gates said, the economy right now is our biggest national security threat. And, the fact that an NSDI capable of tracking PARCELS, of all things, could have served as an “indications and warnings” (I&W) system that could have prevented the meltdown of the global economy. Perhaps US Strategic Command should have owned a parcels I&W system, alongside its global nuclear I&W system! Just in case you are not making the connection, every mortgage backed security is comprised of mortgages that exist somewhere on Earth. More specifically, each mortgage is of a property that is uniquely identified by a parcel number, which can be found on any city or county parcel map. Only, there is no national registry of parcels. And, there is no Federal regulation requiring every mortgage to be tied to a parcel. As such, we now have mortgage backed securities which have a mix of mortgages that each represent different risks. And, since we cannot tie them to a specific parcel, we have no way of disentangling them. 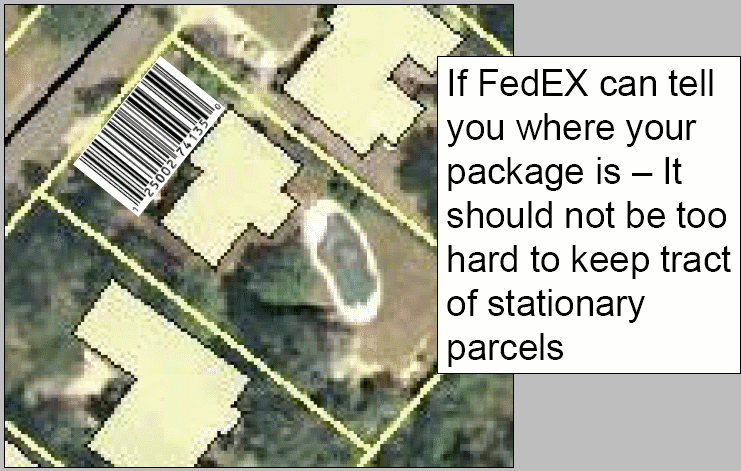 If mortgages were tied to parcels, then each security could promptly be mapped and assessed for their risk. Hell, Zillow would be able to knock this out in a jiffy. But, they are not. So, one would imagine that getting a national parcels layer implemented within a non-dysfunctional National Spatial Data Infrastructure would become a high priority for the Obama Administration to aid recovery and disentangle all of the toxic assets. Just in case you are interested, there is a working group you can join.